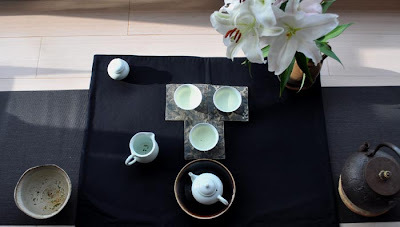 Today, I matched my spring 2009 San Hsia Bi Luo Chun green tea with a qingbai -light green- porcelain set. Why? Green tea produces a light brew. A slight green color adds some life to the color of the brew. An alternative would have been celadon cups. I also wanted a light feeling of the cup on my lips. It matches the light feel of green tea well. So, I grabed my qingbai singing cups. Porcelain! Also, it handles the heat better than glass. The taste comes out more precise. For the top quality greens from China, I would choose silver. But with this Taiwanese green, it would push it too far and release some astringency. 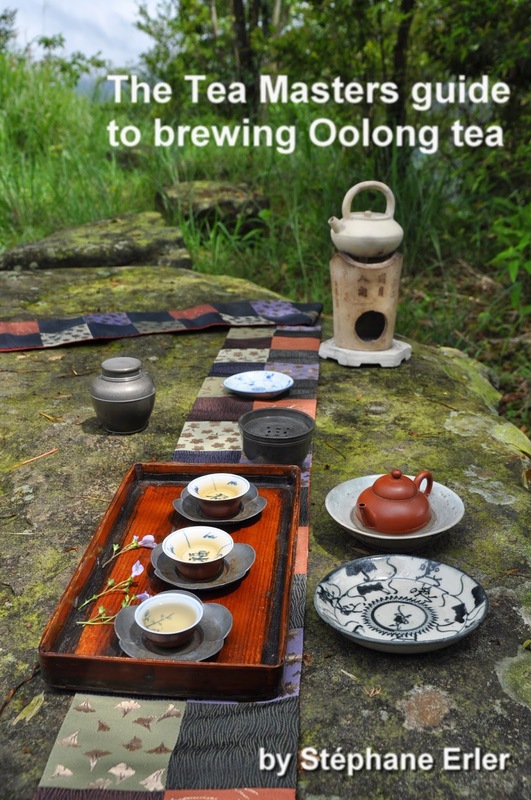 Porcelain cools down much faster than silver, so that we mostly get the first light flavors. All the porcelain accessories are matching: teapot, cha hai, cups and mini jar. On the black side of my Cha Bu, it looks neat and simple. My zafang for used water isn't qingbai, but that's why I put it more on the side. And I don't want 'everything' to match. That would be too boring, wouldn't it? A Cha Xi is a mean to express oneself. This 17 cl for 136 grams teapot is slightly bigger than most gongfu teapots (or gaiwans). 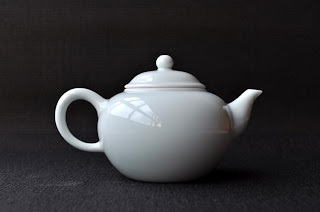 (The price of this teapot is same as the small ivory jar). 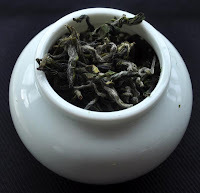 Green tea needs space for its leaves to open up completely. 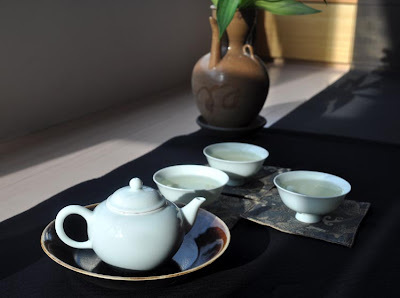 Unlike Oolong, which performs best when it fills the teapot, green tea needs to get rid of its agressive youthful feel by floating freely in the vessel. The brew will is light but tasty. The fragrances are flowery, fresh and subtle. The result was a very good match between the tea, the ware and me! Cette théière vient du même producteur que mes zhongs et tasses qingbai. 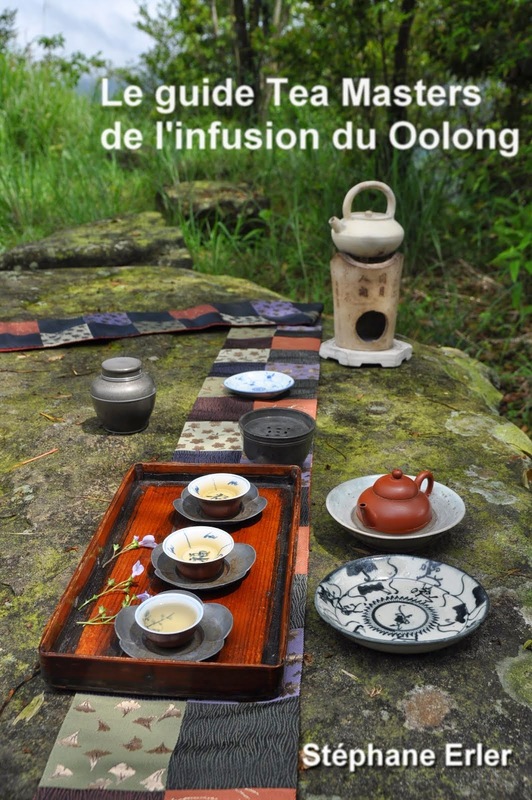 L'émaille est donc la même et le rendu ne change pas beaucoup du zhong. Cependant, ta question reste pertinente, car j'ai récemment acheté des tasses en porcelaine de différentes sources. Et bien que cela soit tout de la porcelaine (et donc 'neutre' au goût) j'ai pu constater de grandes différences entre chaque tasse. I realize the subject under discussion is the beautiful Qingbsi set, which I have and love to use regularly. Try it. Seriously. I've had Bi Luo Chun from multiple sources, some of them quite reputable. Stephane's however (I'm working through his 2011 Spring Bi Luo Chun) is simply the best I've ever had. The leaves are rolled a bit differently, and have a much more vibrant green character. The aroma alone is incredible. I highly recommend it. 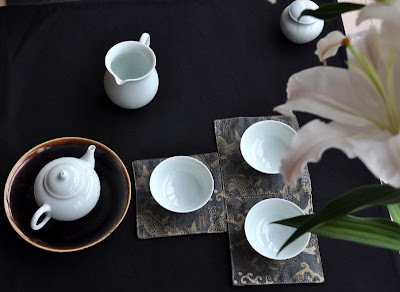 Tip: when using a gaiwan (the bigger, the better, preferable wery thin white porcelain) to enjoy this tea, pour the water gently over the wall of the gaiwan. This way the leaves do not become saturated and they sit on top of the water with only the lower part steeping. Now, in this state (not how visually pleasing it is), lean in and sample the aroma of the leaves - part dry, part wet. This method will work very well for the first infusion, and perhaps the second. But not a third, as the leaves will likely be fully submerged by then.